NextGen Institute of Construction Engineering Private Ltd was formed to create a pool of man power resources for construction/structural engineering industry, by providing adequate industrial exposure to the Engineers through our varied job specific training programs. For the first time in India, NGICE is providing resources pooling for Construction/Structural industry where a group of experienced as well as trained Free Lancers are all tied together to work on the specific projects for specific time period, there after they are demobilised from the project. However these teams not only optimise the project cost but also eliminate the risk of loss while running the down time. Resource pooling best fits for owners who want to have project specific seed teams, it suits the EPC companies where the engineering team can be demobilised after the engineering activities. It also caters to the requirement of consultancy firms where the peak resource loads can be meet as per the project needs as well as maintain the bench at zero cost to the company. NGICE is an association for continuous development of technical skills in niche areas of construction engineering. 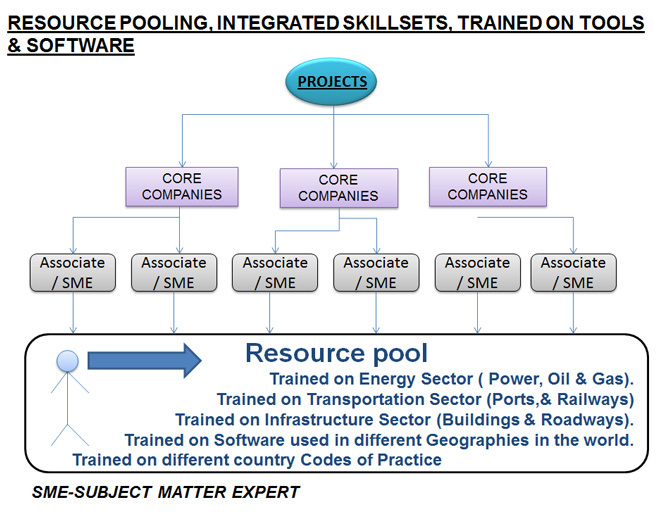 Idle resource who are not on projects are continuously trained and developed on particular skill sets. This not only create a commercially viable business models for the industry but also creates an excellent career growth path, with diversified exposure for the resource/free lancers/associates engaged with NGICE. Aviation Industries. Infrastructure and High Rise.